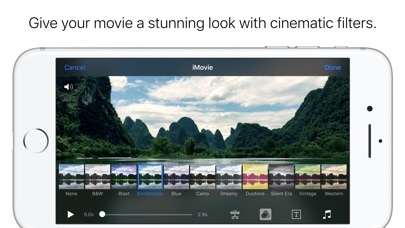 With a streamlined design and intuitive Multi-Touch gestures, iMovie lets you enjoy your videos and tell stories like never before. 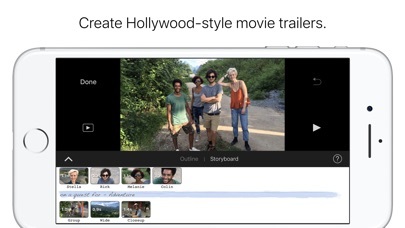 Browse your video library, share favorite moments, create beautiful movies, and watch them on all your devices in iMovie Theater. 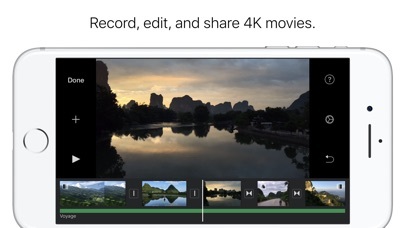 And with the iMovie extension, it’s fast and fun to make every video more memorable — right in the Photos app. Browse and share your videos • Enjoy all your videos in the full-screen Video browser • Quickly share a clip or a portion of a clip • Mark favorite moments to easily find them later Make Hollywood-style trailers • Choose from 14 trailer templates with stunning graphics and original scores by some of the world’s top film composers • Customize movie studio logos, cast names, and credits • Select the best videos and photos for your trailer with the help of animated drop zones • Record video for your trailer right in iMovie Create beautiful movies • Choose from 8 unique themes with matching titles, transitions, and music • Give your movie the perfect look with 10 Apple-designed video filters • Enhance your movie with slow motion, fast forward, picture-in-picture, and split-screen effects* • Create a soundtrack using built-in music and sound effects, songs from your music library, and your own narration • Connect a keyboard and use simple shortcuts to edit movies quickly iMovie everywhere • Use the iMovie extension to enhance video clips right in the Photos app • Easily transfer projects between your iPhone, iPad, and iPod touch using AirDrop or iCloud Drive • Send any project to your Mac via AirDrop or iCloud Drive to finish editing with iMovie or Final Cut Pro X • Share your finished movies and trailers to iMovie Theater and watch them on all your devices with iCloud • Connect an external display to your iPhone or iPad and choose to mirror the iMovie interface or display your video fullscreen while you edit** Share with friends and family • Send videos with Mail and Messages • Save to your photo library or share to YouTube in 4K or 1080p60*** • Save videos and iMovie project files to iCloud Drive • Share videos and iMovie project files with AirDrop**** • Use AirPlay to wirelessly stream video to your HDTV with Apple TV***** * 2x speed-up is available on iPhone 5s, iPad Air, iPad mini with Retina display, and later devices. ** Requires iPhone 7 or later, iPad (6th generation) or iPad Pro (2017) or later *** 4K support is available on iPhone 6s, iPhone 6s Plus, iPad Air 2, iPad Pro, and later devices. **** AirDrop requires an iCloud account and is available on iPhone 5, iPad (4th generation), iPad Air, iPad mini, iPod touch (5th generation), and later devices. ***** AirPlay requires Apple TV (2nd generation) or later. One of the best. And still the leader. I used it just a few to make a 2 part series and edit it. It was fantastic to split screen. I’m glad r the 12.9 feels like a sheet of parchment. The editing is great. This app is great! It’s quite helpful for creating videos and slideshows, but I’ve noticed that recently, when I import multiple photos, it doesn’t allow me to pinch to position. It just show a black screen where it should be. I’ve tried importing as little as 15 and it wouldn’t let me reposition. This is quite a problem for me at the moment. My progress has been halted for this reason. Please address this bug as soon as possible. Thanks! This app is awesome for making fun movies. 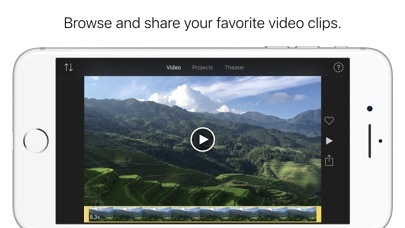 It has everything you would want from making 1 minute trailers to hour long movie! It makes me very happy. No glitches, no crashes, which means a fun and well made app. It opens your imagination and makes life better! Get this app. Plus there is no ad’s!!! No reason you should not get this app!!!!!! I honestly know it might crash for some people but it works fine for me!I honestly dont think people should get that judgy about it bugs and crashes normal.It's really good and great for editing.I know how to make movies fast and slow!It helps me make gacha videos and for putting music in my video without any complication.Please keep up the great work! Doesn’t want to upload on YouTube? When I am done with my project I want to put it on YouTube and when I press the share button it says fails to go up on YouTube.its frustrating because I just want to upload a video for my channel and it doesn’t want to work.i mean I love this app but I just had that problem I don’t have any other problem except that one.I love everything about your app the one thing is that it doesn’t want to upload on YouTube I have been trying and trying it is not working I have tried on different that hasn’t been working I don’t know what to do anybodY CAN JUST HELP ME WITH THAT PROBLEM.okay thank you for your time I appreciate it bye. 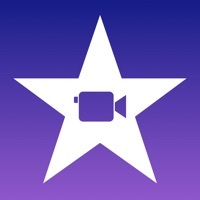 I like IMovie to edit videos. I love this app I used to be so bad at it and stuff but after a good while with it you will get really good at it. I recommend they give tutorial mode for everything cause there is some things I don’t even know about till now. I love how u can choose speed for certain clips separate audio from video and more!!! !